That sounds like some overused line from some romance novel. 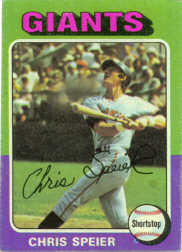 Nevertheless, it’s an appreciated confirmation in the case of Chris Speier. For years, the long-time infielder-turned-coach has been a good TTM signer in care of his teams. You needed to write him during the season. Mail to his Arizona home either got a RTS or items were sent back unsigned in your SASE. I applauded Speier for not trashing everyone’s items. Also, for more than 40 years, he’s maintained a legible autograph. Now, according to Baseball Address List author Harvey Meiselman, Speier has spelled out his autograph policy. He returns a typed message that says he won’t sign at his home and he won’t return the items. The only baffling part of Speier’s update? He writes that items will be donated to charity. Really? The Phoenix Salvation Army will sell used clothing and Speier commons? It would be coolest if he was autographing everything before he donated. Don’t get me wrong: I’ve always been a Speier admirer. I remember Joe Garagiola praising the “young shortstop” on NBC Game of the Week. He pointed out that Speier was backing up the pitcher. If the return throw from the catcher got loose, Speier would make sure no runner advanced. All I want is him not heading for the recycling bin with fan mail. If you say you’re going to give our cards to charity, make the play.